Yay! I was hoping the Lugra would get it’s pirate colour first! Looks good. Oh no, I love this design. I might have to expand out of just collecting babies now. Oooh I am in love! 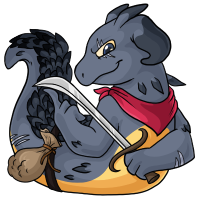 The Pirate Lugra is just fantastic! Ack I wish I could apply but I don’t exactly qualify yet. Good luck to everyone who does apply! Guess what I was saving my pirate SJ for? Omegatortle is getting a lot of new things this week. beautiful! i'm awaiting christmas and next halloween!